Recently, FMC spoke with attorney and copyright expert Lisa Alter (Alter & Kendrick, LLP) about musicians and copyright. Lisa recently wrote an excellent, artist-friendly article on the subject called Protecting Your Musical Copyrights (you can download a e-book version here or read it on the web here). Copyright is a pretty complex issue, but this article does a great job of demystifying it while explaining in detail the protections copyright provides to musical artists. We thought it would be cool to ask Lisa a bit more on the subject, which you can read below. Our conversation is meant as a supplement to Protecting Your Musical Copyrights; for a more detailed explanation, you should refer to the original document. FMC: Why is copyright important to musical artists? Lisa Alter: Copyright is very important to musicians, particularly singer-songwriters. It is the legal structure that protects their rights in a song or composition. FMC: A lot of musical acts, like rock groups or jazz groups that write their own material, might not have a single individual designated as the singer-songwriter. If the material is composed together, is that a joint copyright? LA: Yes. If a song is co-written, it's a joint work in the United States. Outside the U.S. it is necessary to look at the laws of the individual country. FMC: And that applies to the composition and the sound copyright, if they haven't assigned it to a third party (like a record label)? LA: Well, it certainly applies to the actual song. The sound copyright owner would be whoever the claimant is. Often, the record label tends to have a lot of different people involved, though it may also be the songwriter or artist. There are musicians who may render their services as "work for hire" on a recording, so it tends to be a bit more complicated. By the way, songwriters and artists can also have an agreement among themselves as to how the copyright is actually split. For example, if a group has two songwriters, the assumption is that it would be split 50-50, but they could agree to anything -- 60-40, 80-20, 90-10, whatever. FMC: There seems to be a variety of opinions about how important it is to retain your copyright if you're an artist or a songwriter. Do you think the transferal of copyright will continue at a time when an artist has more direct licensing opportunities, like one-shot television uses, etc.? Could this eventually impact statutory laws or private contractual agreements? LA: I don't know about statutory laws, but it might affect how people structure their contracts. Obviously, it's in the interest of artists to hold on to as much as they can. The old deal was that you'd assign 100 percent of the copyright and you'd get the songwriter's share -- 50 percent. 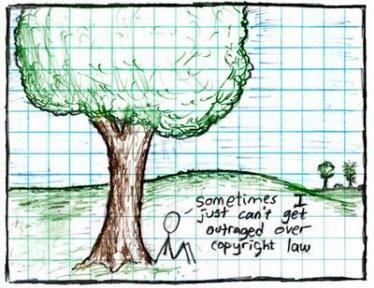 Which is really just an industry fiction; it's not something that's in the copyright law. Those deals still happen, but it's more of an old fashioned way of doing things. LA: It depends. If a song has a well-known life outside of that usage, maybe not -- each use may actually make it more sought after. On the other hand, if a song is associated with a particular movie or a particular commercial, then another advertiser might think "I don't want people thinking about toilet paper when they hear this song used in an ad for our cars." But in general, the more it's out there, in some respects, the better. FMC: Traditionally, having music in an ad or film was considered a driver for album sales. Now, there are a lot of different ways that music can be used beyond physical sales -- there's a performance right for some digital uses like webcasting, and then there's so-called interactive streaming and on-demand listening. How strong do you think the copyright structures are in dealing with all these new uses? LA: I think the copyright structures are strong. The modes of exploitation and contractual arrangements are evolving and will continue to evolve. Copyright is an important protection; the focus is more on adapting this protection as it expands to new uses. FMC: Do you believe that current copyright law needs to be adjusted to deal with the realities of easy duplication and amateur uses like YouTube videos, etc? LA: It's not so much that it needs to be adjusted. As a pro-copyright person, my feeling is that there needs to be an assertion of the application of the copyright law. That yes, it applies in these circumstances. And no, just because you've written a song does not mean that you've contributed to the general good, but you the creator are still entitled to protect your interests, regardless of how its exploited. FMC: Some people would look at "the greater good" as similar to a public library, which we pay taxes to maintain. But what if some of those libraries are having difficulties archiving things digitally, because they may be breaking some aspect of copyright law? LA: There are specific exceptions for what a library can and can't do in those particular circumstances. In addition, the good of the public needs to be balanced against the rights of the creator. Say your business is having a farm. That doesn't mean that the public, just because they pay taxes, can take your milk for free. FMC: That reminds us of the true story of a Scandinavian heavy metal band that protested one of their local politician's supposedly soft views about copyright online by hopping his fence and stealing one of his sheep. LA: Well, it goes back to the importance of understanding what your copyright rights are. Again, if you had a farm, you'd know how many chickens and hens and geese you had, and how old they were and whether they were still producing. And if you have a farm full of songs, you should have the same kind of information. FMC: Younger songwriters might wonder if or why they need a publisher. Can you collect your royalties from a Performance Rights Organization (like ASCAP or BMI) directly? LA: They need a publishing entity. But that could simply be "Your Own Name Publishing." It doesn't even have to be a corporation or any kind of legal entity -- just a "doing business as" is fine. They need to sign a separate publisher membership application with the PRO, but they could certainly do that and not have to go through a third-party music publisher. FMC: So why do people go through third-party publishers? Is it that they have more leverage in administering rights? LA: Well, in the old days, the publishers had the actual "song pluggers," who used to go out and push the songs to other artists. They'd be able to approach the music directors at film studios and ad agencies, and the publishers were where those people would go when they were looking for a song. And that's still true to a greater or lesser degree. Also, the publisher is up-to-date on the current licensing fees. For example, if someone calls the actual writer and says "I want to use your song in a commercial -- what do you want for it?" the writer may have no idea. These things move very quickly, and the publisher would know the going rate. Again, if the publisher is acting as the administrator and taking a small fee, it may well be worth to have them in that role, because they know the business and have the connections. FMC: Here's a technical question we wondered about when reading Protecting Your Musical Copyrights: How is it that record companies can get away with paying less than the full statutory rate on mechanical royalties? LA: I've always been surprised that no one has litigated that. To me, it's a blatant and successful effort to end run the law. I think it just perpetuates a practice of artists being taken advantage of. FMC: Do you think blanket licenses could ever apply to musical copyrights online? Do you have an opinion about that? LA: I think everything needs to be explored to facilitate payments being made to ensure that music is legally transmitted online and artists and songwriters are paid something that is collectively determined to be a fair and reasonable market rate. I've always thought that making it easier to get these licenses. Now, that doesn't necessarily mean cheaper, but easier -- streamlining the process will make it more likely that people will do it. If the process is too complicated, the average person may just ignore it. FMC: Can you tell us about "termination rights?" LA: Termination rights are important because traditionally, songwriters did grant their rights in perpetuity -- it was very common to grant the rights for the life of the copyright. Under the US copyright law, there are provisions where, if you provide notice within the statutorily set time period, either the writer or his or her heirs can terminate the grant and get their rights back. Obviously, if the song is popular enough when that time period rolls around and is still earning or has the potential to be earning, then it can be very valuable for the writer or his or her heirs to get the rights back and either exploit it themselves, or enter into a more favorable deal. FMC: Do you think that the US termination rights could put too much of a burden on the artist or their heirs to notify the grantee? LA: It was a heavily negotiated and lobbied right. It came about because copyright in the US kept getting extended. And Congress said, "well, the author made a deal thinking the term of copyright was only 28 years, or only 56 years or only 75 years" -- now that the term has been extended, the author needs to have a chance to get out of a deal that he would have gotten a lot more for had he known how long the term would be. You can justify some of the decisions that were made, and some I think were a little more skewed in favor of the publisher. On the other hand, the definition of "statutory heir" has been expanded -- originally it was limited to spouse, children and grandchildren, now it includes executors and next-of-kin. FMC: Sometimes you hear people -- even musicians -- say things like, "MP3s aren't worth anything; they're just promotional." Do you think we'll ever have an environment again where the duplication and use of copyrighted works, regardless of type, will regularly result in artist compensation? LA: I certainly hope so. My sense is that around the time that online transmission was just starting there was a lot of buzz about how copyright laws were depriving the public. But I've sensed some backsliding on that. I think that if people really think about it, they can understand the value of having a creator be able to make a living from the creative process. And it's important to encourage that. If you look at it from that perspective, I think you'd be hard pressed to come up with reasons why a creator should be less entitled than someone who makes a living any other way.